In Deaf to the Marrow, public anthropologist Audrey C. Cooper examines the social production and transformation of ideas about language, bodies, and state-structured educational institutions in southern Việt Nam. Focusing on the reform period (1986 to the present), Cooper describes the ways that signed-language practices, ideologies, policies, and programming shape and are shaped by Deaf people’s social engagement in and around Hồ Chí Minh City. 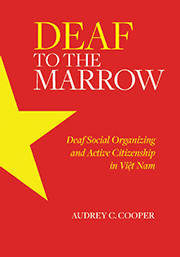 Drawing on research data and work with Vietnamese Deaf colleagues covering an eight-year span, Cooper develops ethnographic and language-centered accounts of Deaf social organizing. These accounts illuminate the ways that Deaf citizens are assuming self-determining roles, or active citizenship, in decisions of local, national, and international importance. By placing Deaf social action in the historical context of state development and modernization projects, Cooper shows how educational structuring reflects dominant, spoken-language-centered views of Vietnamese Deaf people and signed languages. She also addresses the impact of international aid agendas on education, especially those related to disability. Deaf to the Marrow examines perspectives largely ignored in Deaf education, Deaf studies, signed-language linguistics, and anthropological literatures, thereby contributing to scholarship on language and sociopolitical formation broadly and the study of Deaf people’s citizenship practices specifically. Audrey C. Cooper is a public anthropologist and an assistant professor and director of Gallaudet University’s Masters Program in International Development.